Wedge Anchors are made from standard zinc coating, stainless steel 316 and stainless steel 304, acid-proof steel, brass or any material which are passivated and tested to ASTM and other International Standards. The available range of Wedge Anchors are threaded, torque controlled for consistent and quick installation. 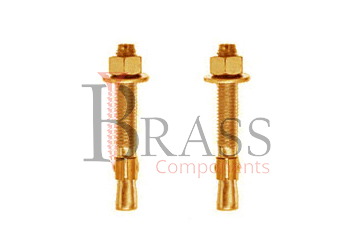 Wedge Anchors are available with Chrome, Zinc, Tin, Electrolytic Tin, Copper, Natural Brass or any type of coating as per custom requirements. They are available in any metric or imperial sizes as per Custom Specification. Wedge Anchors are capable of withstanding high loads. The Conical Wedging element has an internal thread. The knot serves to secure a rigid fixation in the hole. The sleeve is removable and cylindrical type. The large diameter of cap or head provides a sufficient area of clamp which is important when fastening the metal sheet, profile and thin sheet elements. Not exposed to high humidity environment, Provide Long Lasting performance. Permissible load on tearing and shearing. Wedge Anchors are with controlled torque for preset, through and remote mounting. General range of wedge anchors provide highly reliable, durable and long-lasting fastening. The Wedge Anchor is inserted in the process of installation by the side with the spacer unit into the pre-drilled hole & carefully clogged with hammer. The shank is drawn into the coupling and the spacer unit firmly fixes the anchor in material. Standard range of wedge anchors are available with High Loading and shear stress due to steel strength. The end of the special shape protects the thread when the anchor is plugged into the hole. Widely used to perform on the installation of heavy metal structures, cable routes, hinged consoles and also various type of railing fencing. Wedge Anchors provide Quick installation and fixing of suspension structures. The Custom range of wedge anchors are applicable in those situation when objects with large dimensions and significant mass are to be reliably fixed on the surface of walls, floor and ceiling made of strong materials. For high loads when mounted through a fastened part in stressed or non-stressed concrete and natural stone. We manufacture Wedge Anchors as per Custom Specification and export in Finland, Jersey, Spain, Switzerland, Ukraine, Austria and other European Countries. For more Information, Please Contact Us or Inquiry Now.